According to Benchmark Mineral Intelligence, there are now 70 lithium-ion battery megafactories under construction across four continents, 46 of which are based in China, with only five currently planned for the U.S.
Simon Moores, managing director for Benchmark Mineral Intelligence, recently testified before the U.S. Senate Committee on Energy and Natural Resources. Moores last testified in October of 2017, just over a year ago when the total number of megafactories was just 17. 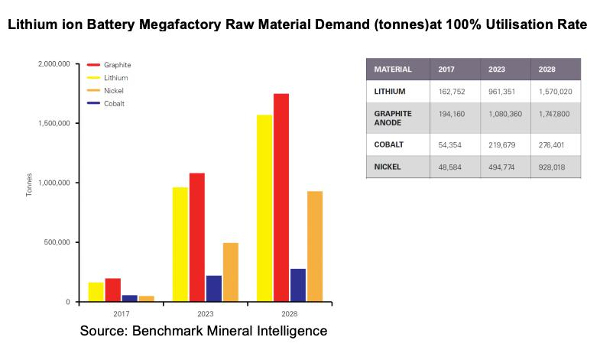 Since that testimony in October of 2017, planned lithium-ion battery capacity in the pipeline for the period of 2019-2028 has risen from 289GWh to 1,549GWh (1.54TWh) in Benchmark Mineral Intelligence’s February 2019 Assessment. This is the equivalent of 23-24 million sedan-sized electric vehicles. Moores testified that the megafactories are being built almost exclusively to make lithium-ion battery cells using two chemistries: nickel-cobalt-manganese (NCM) and nickel-cobalt-aluminium (NCA). Moores went on to explain that lithium demand will increase by over eight times, graphite anode by over seven times, nickel by a massive 19 times, and cobalt demand will rise four-fold, which takes into account the industry trend of reducing cobalt usage in a battery assuming a 100% utilization rate where each plant scheduled is built and operating at full capacity. Where will the supply come from? How will supply chains develop if companies and countries don’t accelerate their commitment to sourcing these materials? So join Outsider Club today for FREE. You'll learn how to take control of your finances, manage your own investments, and beat "the system" on your own terms. Become a member today, and get our latest free report: "How to Invest in Rare Earth Metals - And Profit"
Lithium, cobalt, nickel, and graphite supply is necessary and, in the U.S. where its near non-existence is — pardon the pun — critical, if the U.S. is going to have a chair at the critical materials supply chain table. There are opportunities but investment dollars have thus far been scarce and government, as always, has been slow to recognize the vulnerability and act with any kind of urgency. Tesla is the sole U.S. lithium-ion battery manufacturing producer with its Nevada Gigafactory. Idaho has a well-known and defined cobalt belt that provides the U.S. an opportunity to secure the highest-risk lithium-ion battery raw material — cobalt. In 2018, China was responsible for 56% of the world’s flake graphite supply. China also accounted for 100% of the world’s uncoated spherical graphite supply, which is the processed anode material that is used in lithium-ion batteries. According to the testimony, U.S. cobalt dependency comes in at 100%. Western Australia recently outlined a strategy to cut red tape, reduce costs for companies, and build skills bases needed for new mining and battery material processing projects. A new approach developing these critical supply chains in the U.S. can provide for high-paying jobs and sustainable tax revenue. Whether it’s cobalt, graphite, lithium, nickel, or uranium, the U.S. is in a vulnerable position that requires action, but like our deficit and our infrastructure, I worry that future generations will have to do the work that current politicians refused to. I’ll be watching closely for the outcome of the Section 232 investigation and negotiations with China. If you speculate in the space, you should as well. I’ll also be adding to my favorite way to gain exposure in this transformational megatrend. A play I was early on but one whose best days are ahead of it. Mr. James Dines is a legend whose insight has been proven time and time again. One of those insights was a very early bullish call on investing in marijuana, making Mr. Dines "The Original Pot Bug." Today we bring you an excerpt of The Dines Letter discussing it. It is starting to look like we should stop focusing on if it is too late for the Fed to keep the economy above water. We very well may be well past the point of no return and should plan accordingly.